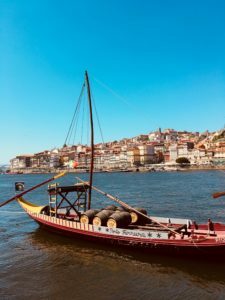 Due to my strong personal interest in getting to know Portugal and to learn more about working abroad as an architect I was really looking forward to starting this experience in Porto. Porto is Portugal´s second biggest city in the North. Famous for its Port wine it also has a lot to offer when it comes to architecture and design. Porto´s city centre belongs to the UNESCO world heritage, therefor Porto has a huge responsibility concerning the preservation of the historical centre, which is a very interesting aspect for myself as an architect. When I arrived at the office I immediately was introduced to the team, all of the team members welcomed me really warmly and showed me the ongoing projects which I really liked. Therefore I got the feeling to take a part in the team right away and to have an easy start in the exchange. In the office, I also got the chance to work on a renovation project for an apartment in Porto´s city centre. My task was to work on the construction drawings for the contractor, who is coming to the office on a regular basis. During August I also got the chance to work on several projects of different scales, topics and workings stages which helped me to get a good insight of the office structure. I was working on an urban planning project, where I was supporting the team in drawing sections from the master plan to present in a presentation. This project was also a collaboration with a Swedish architecture office, to plan the landscape design. It is always important to learn about the different teams and organizations working all together on one project. I learned how to coordinate tasks and responsibilities and as well as how the office communicates with clients. I got the chance to work independently to be able to take part in the creative process. I was working across computer programs in 2D and 3D which allowed me to improve but also contribute my experience to the design. We took time to talk about my business plan to get a first feedback on how to improve but also evolve the next stages of planning. We discussed that during this exchange I will work on acquiring management skills together with my host. It will be very interesting to see what will be different or the same in terms of architecture and design construction regulations in Portugal. During ongoing projects, I will be given the chance to participate in office activities within the design team. The first month was already a great start, with a lot of input. I am really looking forward to the next month in Porto and at the office!